The Food Recovery Network is a program focused on tackling food waste and food insecurity in Saint Mary's own neighborhood. Each Tuesday and Thursday, students come together, box up leftover food in SMC's cafeteria, and take the food to shelters in the Contra Costa area. 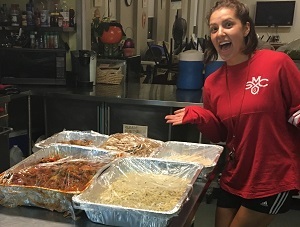 Not only does the group ensure that leftovers avoid being wasted, but the students also supply a meal to those in need. In 2016-17, students transported around 2,000 lbs of food, which is around 1500 meals! This semester, the group is looking for more volunteers to help deliver even more food! If you would like to get involved, please email Bri Stuart at brs4@stmarys-ca.edu and we will add you to an email list of future volunteers. We look forward to meeting you and working together to help our community!